How will Pregnancy Affect your Hair? Pregnancy can affect hair in many different ways. You’ll be surprised to know that this is often the case in both sexes, due to increased stress, anticipation and changes in lifestyle when expecting a baby. Some women report their hair looks better than ever during pregnancy. In fact, during our study, a third of the women questioned said they saw an improvement in their hair after four to five months. They noticed it looked and felt thicker and had more body and shine. However, the other third found that their hair was more problematic than usual - that it was drier and needed extra moisture. And the remaining third noticed no difference at all. It isn’t fully understood why certain women have wonderful hair during pregnancy and others do not. We believe it’s because hormonal changes vary in each individual, and during different pregnancies. Also, the sensitivity of hair follicles to these changes is different. It’s impossible to estimate in advance what these effects will be. Your hair can be great during a first pregnancy and be quite the reverse in the second – or vice versa. Rest assured though, if you do experience hair issues, it’s very rare for a woman to have problems with her hair throughout all nine months. The last three months in particular should be very good for your hair. During the first trimester your hair may feel thicker. But it won’t actually be thicker so early on, due to the rate at which hair grows. Hair only grows half an inch a month, so it would take around 6 months to a year (depending on the length of your hair) to notice any actual change in overall thickness. Perceived thickness happens because pregnancy immediately increases oestrogen levels and reduces the circulation of androgens (male hormones). This causes your follicles to produce less sebum – oil – and so you get bouncier roots and more body. However, less sebum can also make your hair feel drier, so make sure to moisturise and hydrate your hair. Occasionally scalp conditions such as psoriasis can temporarily disappear during pregnancy. However, your hair and scalp usually go back to their previous state once your baby is born. In general, very few hairs are shed during pregnancy, so your hair will often be much thicker and fuller towards the middle and end of your pregnancy. This is because raised oestrogen levels keep your hair in the growing (anagen) phase for longer than usual. 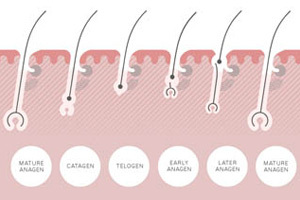 However, post-partum hair loss can occur a few months after giving birth due to oestrogen levels dropping back to normal. A foetus requires a huge amount of energy to grow, and so do your hair cells. However, your body will quite rightly prioritise your baby’s needs over that of your hair. To help keep your hair healthy, follow the four-hour nutrition rule. Snack on a complex carbohydrate such as fruit/wholegrain toast if more than 4 hours is left between meals. Always consult your doctor/GP before making any changes to your diet. Your hair may be drier than usual during pregnancy. 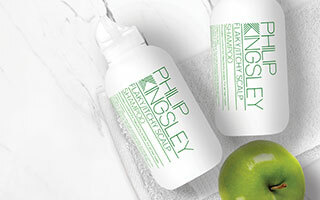 To combat dryness, treat your hair to a weekly pre-shampoo conditioning treatment such as Elasticizer. A temporary change in your shampoo or conditioner to one that is more moisturising may also be helpful. Don’t over-brush or over-dry your hair. This can cause damage and breakage, especially as your hair may already be drier than usual during pregnancy. Above all, try not to worry about your hair. Apart from a hiccup or two at the beginning, by the end of your pregnancy the chances are that your hair will look and feel wonderful. 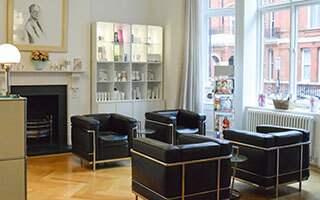 If you would like to know more, our clinics based in London and New York specialise in hair and scalp issues.